Many of the great expedition trekking trails have been taken over by lodge operators who have, unfortunately also taken out the romance associated with expedition style treks. The line of porters preceding a trekking party says something about logistical management efficiencies in the high Himalaya, the rows of tents set up awaiting trekkers at a camp site with its dining and kitchen tents, and toilet tents – separate for ladies and gents if the group is large enough, trekkers partaking breakfast in the early morning sun speak of a romantic luxury mostly confined to older editions of guidebooks. However, there are still those areas in the Nepal Himalaya where trekking, as it was, is still possible and this is one of those rare gems. This is a hard trek suited for the fit and experienced trekker looking to get away from the hustle and bustle of the regular trekking routes and require the limited use of some climbing equipment including crampons and ropes. The views here are not of world famous mountains but rather of those that time, mass trekkers and climbers forgot. The villages are a microcosm of rural Nepal rarely seen these days, the people are friendly – not overly so, as only those who have limited contact with the outside world can be. But the views are nonetheless stunning, the scenery rewarding and the environment untarnished by modernity. Fly from Kathmandu to Lukla (2800 m.), trek through the Sherpa heartland of Namche Bazaar (3500 m.) Views of Mt. Everest – 8850 m. are available from the trail leading up to Namche and from the ridge above the town, on to Thame (3800 m.) leaving the last vestiges of civilization behind. From a moraine camp above Thame climb towards Tashi Labtsa (5755 m.) crossing it to descend down into the Rolawaling valley. The views of Mt. Thamserku (6608 m.), Ama Dablam (6856 m.), Khangtega (6685 m.) to your rear and Makalu (8463 m.) in the distance, Teng Kang Poche (6500 m.) and Panayo Tippa (6696 m.) closer to hand provide stunning backdrops seen by very few people. From the pass Mt. Takargo (6793 m.) and an unnamed peak are before you. The Tram Bau Glacier is below and Mt. Pachermo (6187 m.) and the Tengi Ragi Rau (6943 m.) are on either side while other Himalayan giants are behind you. Descend from Tashi Laptsa on the Rolwaling Valley side mindful of hidden crevasses along the glacier. Descend an ice wall using ropes which your crew will gladly help you with to the glacial lake at Tso Rolpa. This lake has been in the news lately as it has expanded rapidly due to global warming and is in danger of bursting its wall and wreaking the lower valley with a devastating flood. The Government of Nepal has a program whereby they have been pumping out the water in the lake in a controlled manner to lower the pressure and subsequent danger. 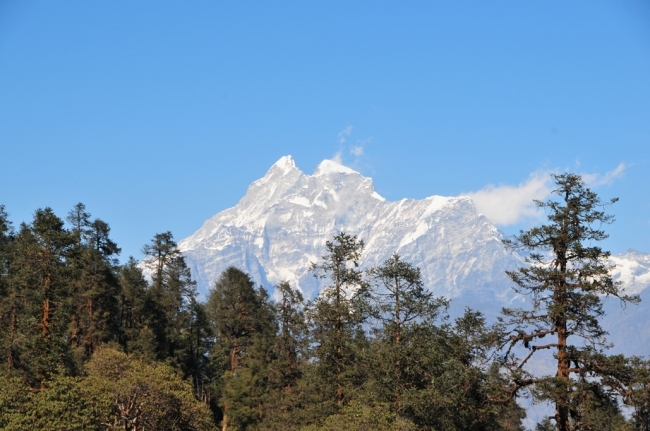 As you descend from Tso Rolpa to Na Gaon and then to the village of Beding the views are of Pigphera-Go-Shar (6730 m.) and Pigphera-Go-Nup (6660 m.). From Beding Melungtse (7181 m.) is visible. Descend further to Chyalche, Simgaon, Manthale and then to the road head at Charikot from where you will drive back to Kathmandu. For healthy and fit adults. May involve travel over difficult terrain and / or travel in altitudes in excess of 4500 m. and may involve crossing multiple high altitude passes. Day 01 arrive in Kathmandu . Arrive Kathmandu, meet and transfer to your hotel. Overnight at hotel on breakfast basis. Free day in Kathmandu to make final preparations for your trek. If you feel that you are adequately prepared and would like to have an escorted sightseeing tour of Kathmandu city, we will be glad to arrange it for you. Please ask for this service from our representative upon arrival..
trek to Namche (3500 m.). Overnight at lodge. Rest day at Namche for acclimatization. Overnight at lodge. Trek to Thame (3800 m.). Camp. Day 07 Trek to Moraine camp above Thame. Day 08 Trek to the base of Tashi Laptsa. Day 11 Trek to Beding. Day 12 Rest Day at Beding. Day 13 Trek to Gyalche . Day 14 Trek to Simigaon . Day 15 Trek to Manthale . Day 16 Trek to Piguti . Day 17 Trek to Charikot. Day 18 Drive to Kathmandu. Drive to Kathmandu. Overnight at hotel on breakfast basis. At an appointed time, transfer to the airport for your departure form Nepal.